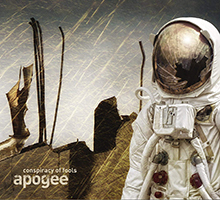 “Conspiracy Of Fools” is the second Apogee release on the Progressive Promotion Records label. But in fact it is already number eight under the flag Apogee. Originally a side project by Versus X singer, guitarist and composer Arne Schafer. Looking at the CD Booklet of this new album, you will notice that Arne is also responsible for the keys, bass and vocals. So the composer is also a multi instrumentalist! He is only assisted by drummer and percussionist Eberhard Graef, a wise decision. Five of the six songs are long tracks in the region between 10 and 14 minutes. The remaining track is a shorter acoustic song. The first 13 minutes of this album are for the title track “Conspiracy Of Fools”. It has a nice melodic instrumental opening with lush keyboards and guitar parts. During the first vocal parts the musical palette is extended with acoustic guitars and bass. You can find a lot of layers in the music (this counts for the whole album), even the vocals are sometimes multi layered. So you can enjoy fine vocal harmonies. As a keyboard lover I love all those vintage keyboards and virtual instruments. You have to listen to this album several times to discover all those layers. The next track is called “Incomprehensible Intension” and is even a minute longer than the fine opener. It opens with a delicate piano tune that is later accompanied by Mellotron flutes and electric guitar. Sometimes the keyboards are more classical influenced and the other time they are more into a Neo Prog style. Halfway the song you can find beautiful keyboard orchestrations and some fine electric guitar solo parts. This long song has a nice constructed bow of tension and has the so needed diversity. This is followed by another 13 minute song; “Override Our Instincts”. I love the classical oriented orchestral arrangements you can find in some places of this track. You can also find some nice vocal melodies in this song which has a much stronger second part. After those three long tracks it is time for the shorter one. “Losing Gentle Control” is a shorter acoustic song with a duration of almost five minutes. This piece with nice acoustic guitar parts which sometimes has a Classical or Spanish character divides this album into two parts with three or two long tracks. Personally I think that the second part with the songs “Colors and Shades” and “The Whispering from Outside” is as strong as the first one. In “Colors and Shades” you can find lovely guitar melodies and a second part with with the most beautiful Mellotron strings and flutes. For me this is the instrumental highlight of the album. The album ends with a track called “The Whispering From Outside”. It has a mysterious keyboard opening and the multi layered vocal parts are working fine in this piece. Arne uses some classical oriented keyboard sounds and the melodic flute part is very nice. In the end the classical orchestrations are combined with a slide guitar. A worthy ending of a nice album.